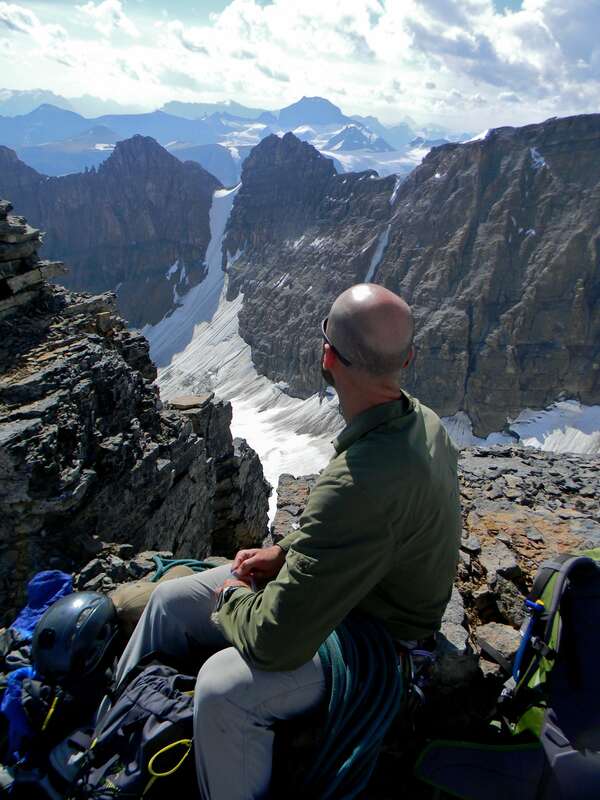 To continue my mountain skills education, I signed up for more training this August. 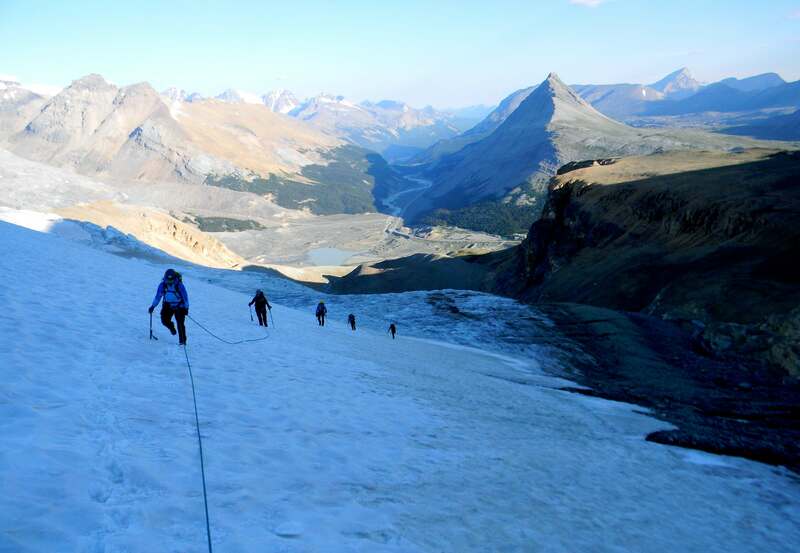 By nice coincidence in my last few weeks of work, I got an email from Mountain Skills Academy asking if I was interested in a “learning climb” they were offering to people who had already taken glacier rescue. The only problem was it was very close to work. 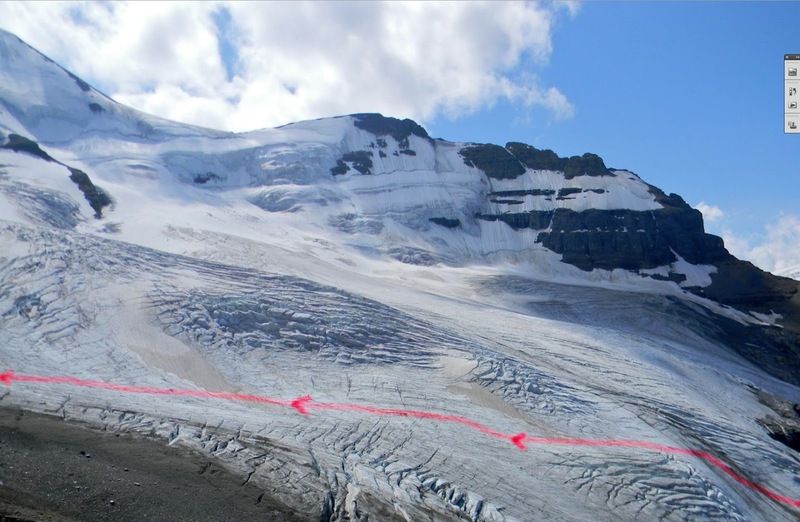 I had to work extra hard to get all my field and map work done and just got home in time to pack up my equipment and take off to the Columbia Icefields. Because the mountain we were doing was big and technical, we planned on leaving at 3:30am! We met at Beauty Creek (just a few kilometers from our starting point) the night before and made some rough plans. It was pretty hard getting to sleep early as I was pretty excited and nervous. 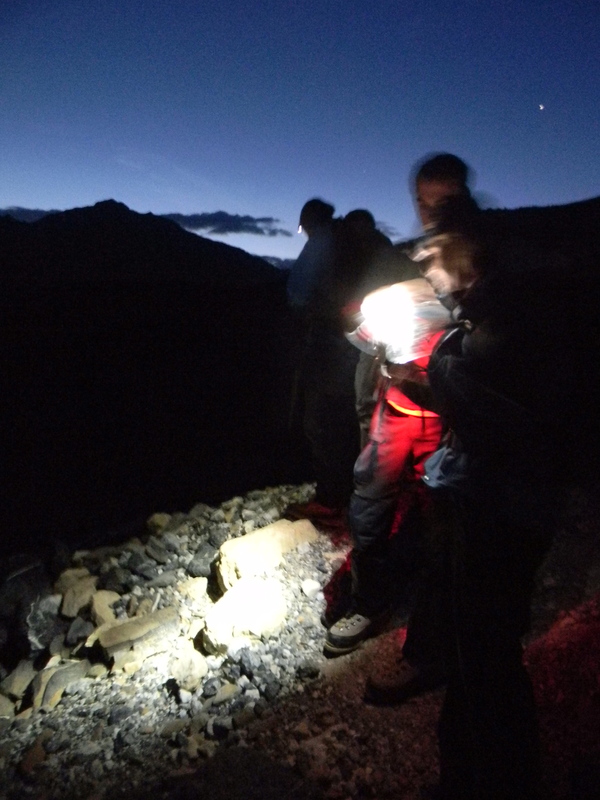 The alarm went off after a seemingly non-existent sleep and I put on my headlamp and had a few granola bars with everyone. In the blackness we made our way to the Athabasca Glacier and started the long trudge up the lateral moraine. Above: Climbing out of the valley. The mountains at dawn are just incredible. 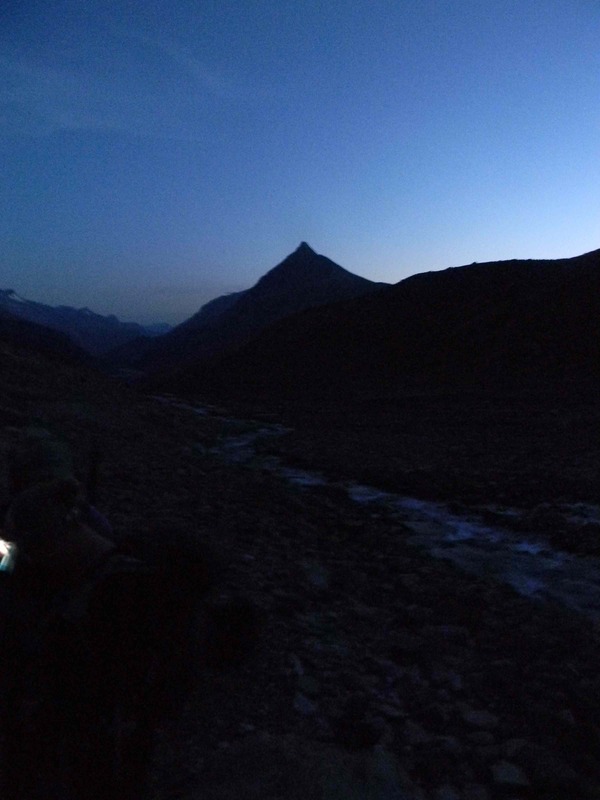 Above: By leaving so early, we arrive at the difficult part of the trip at first light giving us lots of time to make our climb. At this time of the year, you really don’t want to be on the ice late in the day when rocks unthaw and rocket down the glacier. Above: Guide Kris leads up a steep three pitch ice wall. Three pitches means three 60m rope lengths. This means that when he gets close to the end of the rope he must put new anchors and secure the rope. Then I take out the bottom anchors and climb up protected from the top anchor. The pattern then repeats. Ice this steep requires “front-pointing” where just the toe picks of the crampon are kicked in. It takes confidence to feel you are glued to the ice and won’t fall. It also takes some serious calf strength to cling to the ice for this long! Lots of communication is involved from everyone to do everything smoothly and safely. Below is a typical anchor set up: two ice-screws with a sling connecting them to equalize the load on them. 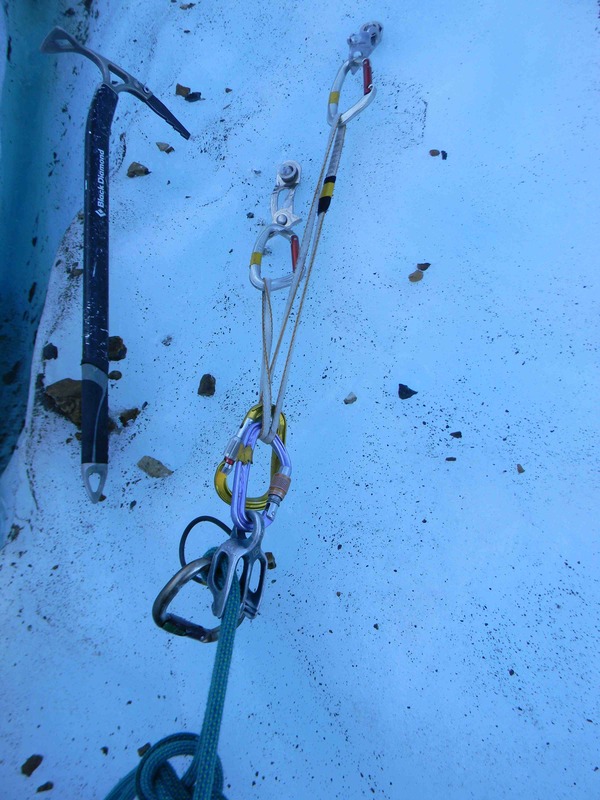 Attached to the anchor with the purple carabiner is a friction device so the lead climber can easily brake the rope in case of a fall from someone lower down. 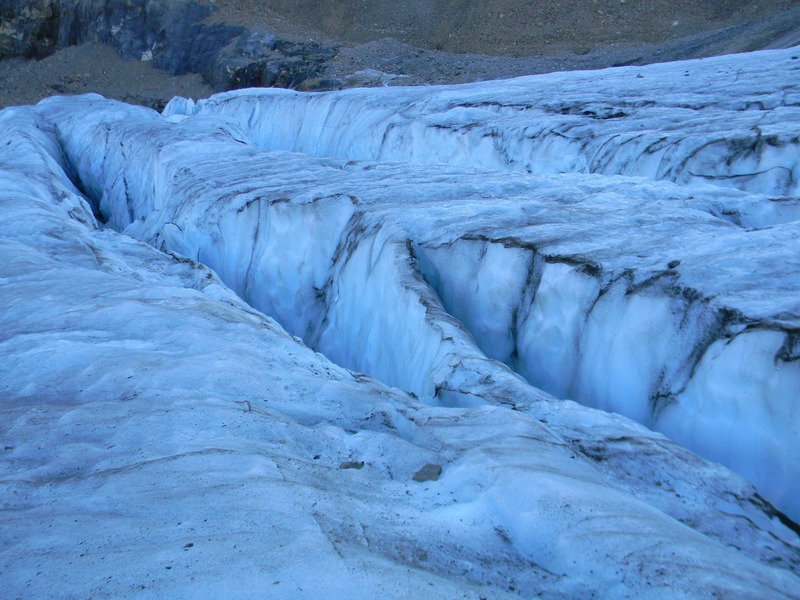 Below: At this angle, the ice is slippery enough that a fall is identical to freefall only with rocks and gravel to tear you up! For speed, we split into two rope teams and climbed side-by side. Here Hugo leads up the steep icewall on North Glacier in the early morning light. This ice is hard like a marble floor. 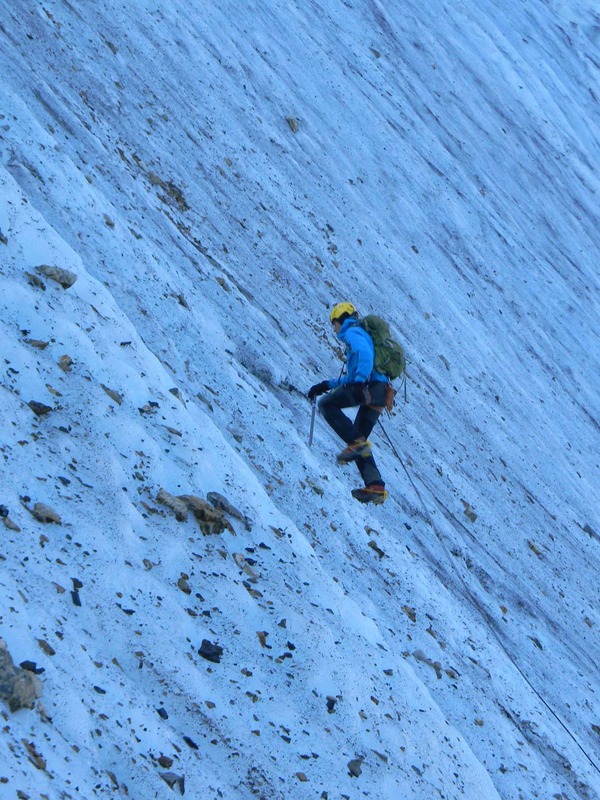 After climbing the wall, our route flattened and traversed across an exposed crevasse field. 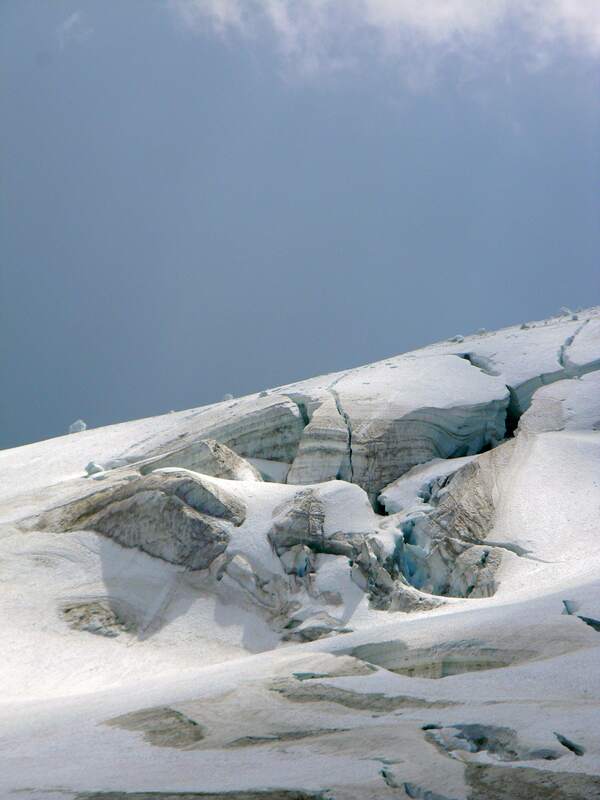 These crevasses are not covered by snow so you can see them easily. The trick is to pick a simple route around or over them. 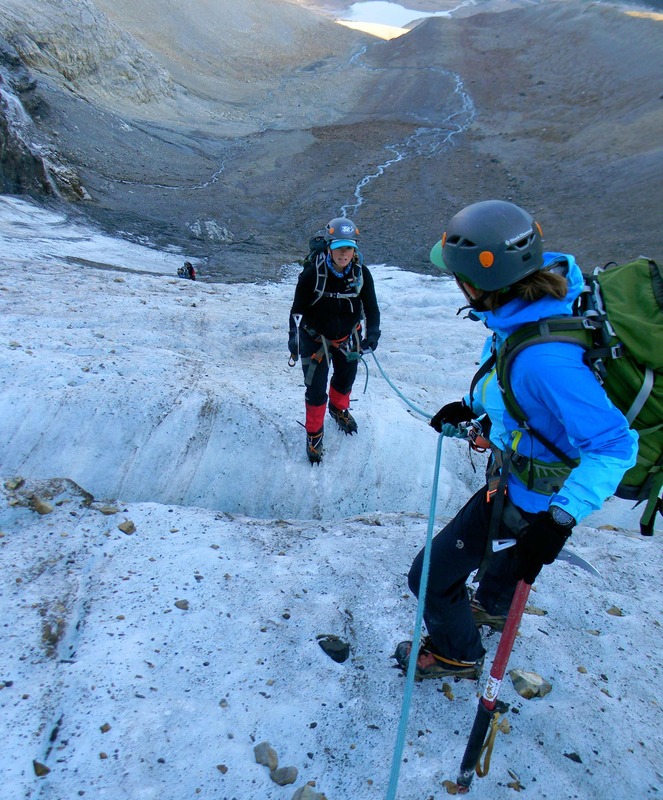 Above: Katrin seems reluctant to jump over this crevasses. The camera angle makes it seem pretty easy but you can also see us digging in and ready if she falls. Perhaps a side view will make her caution seem well placed! 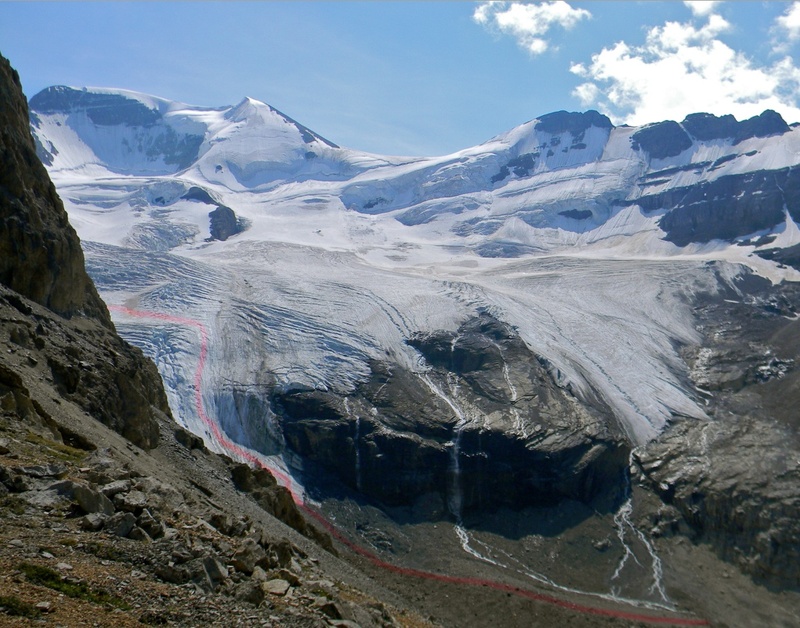 Above: This composite picture taken during an equipment check gives a better hint at the crevasse obstacles on our route. Above: We’ve now reached the firn line. This is the elevation at which the new snow doesn’t melt. 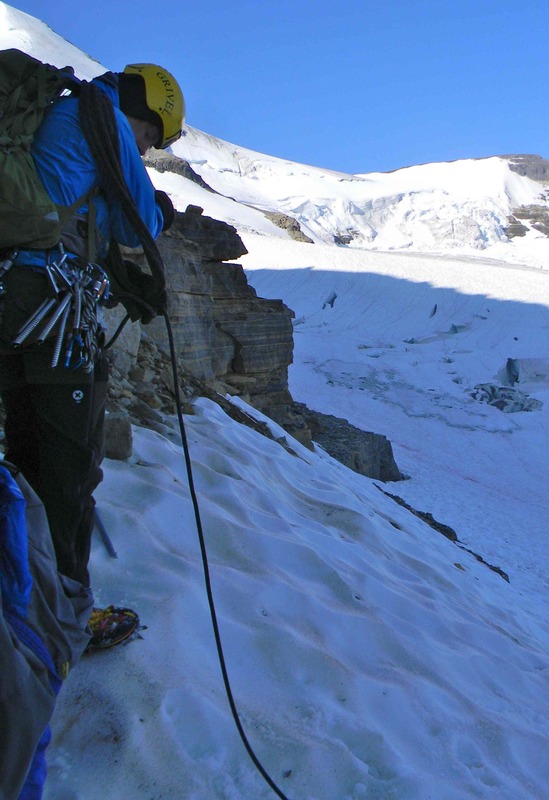 This point on becomes dangerous as the crevasses are hidden underneath the snow. In some cases the snow bridges will hold you up and in some cases they won’t. We rope up widely spaced with just enough tension on the rope to minimise the fall distance if one were to break through. 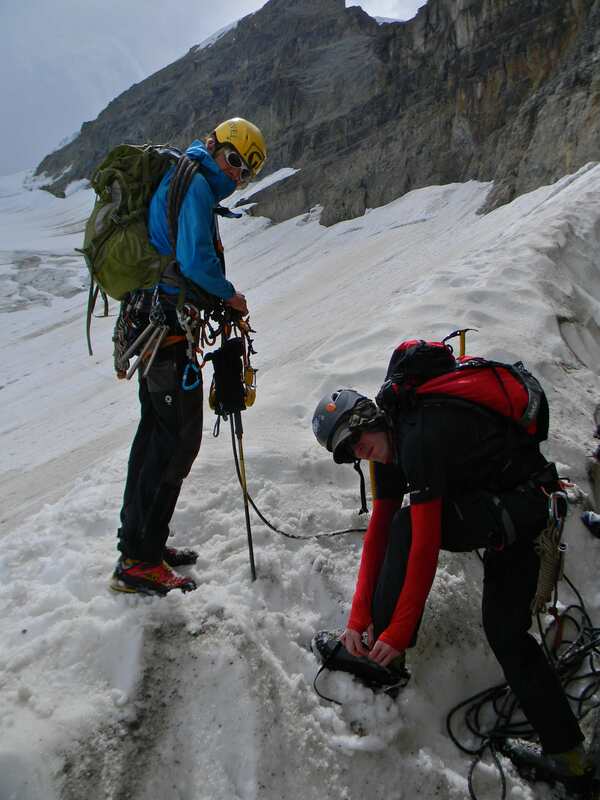 Above: Our route takes us over a large rock wall so it’s time to remove the crampons (and get some relief for our feet) and coil up the rope for the moment. In the background is Mt Silverhorn and a glimps at the difficulties in travel around this neck of the woods! At the top of the rockface we could finally see our objective: the ingloriously named A2. 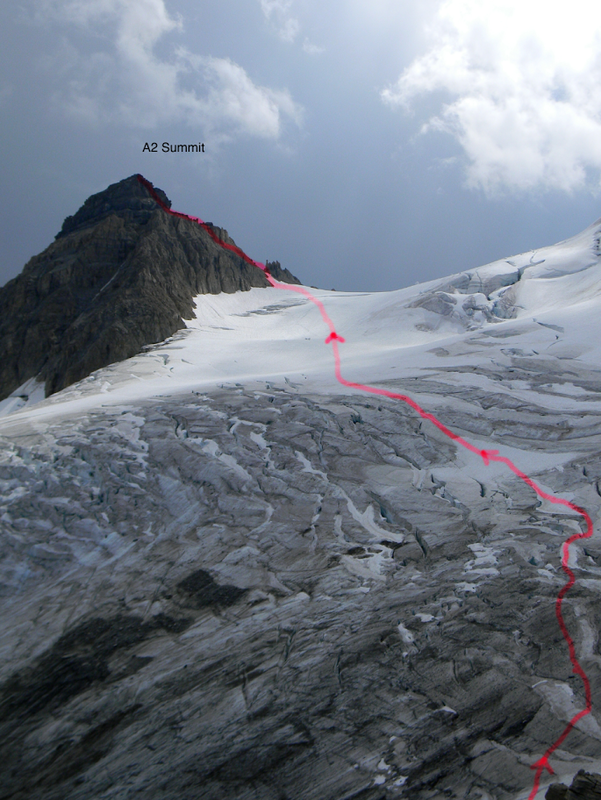 Above: As we crested the rockwall, the Boundary Glacier protecting A2 came suddenly into view. I admit I was pretty unnerved at the sight of its hundreds of deep crevasses. Our guide asked if anyone wanted to lead this section and I immediately said “Yes!” It’s such a good opportunity to lead in hard places knowing that there is an experienced guide there if you’re about to make a mistake. From the high vantage point I studied the face and picked out a route and ran it past Kris who agreed and off we went. 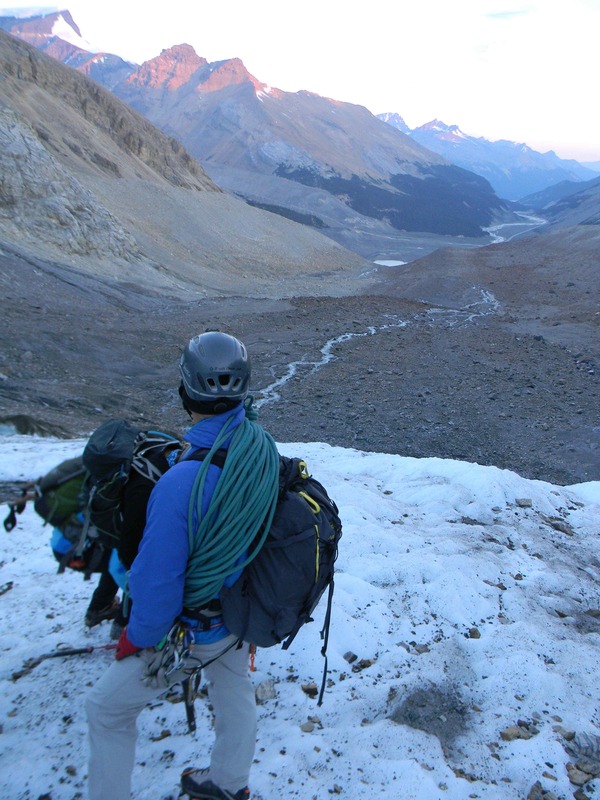 Above: After a short rock descent, we put the crampons on and geared up for glacier travel. I found my ski touring experience very useful here. When you’re skiing up the mountain you must always be looking up planing your route and not down in front which is easier. 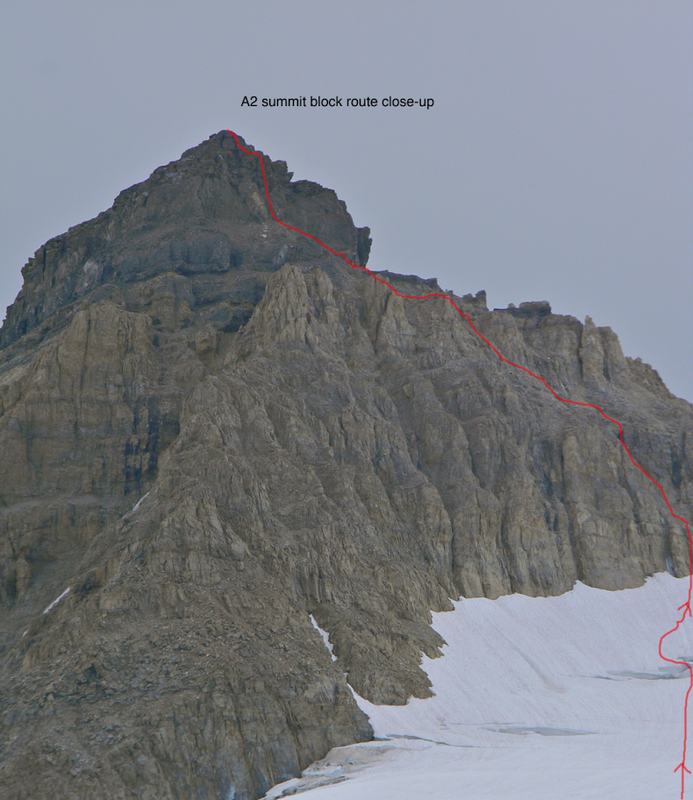 For the most part it went well untill the final massive crevasse before the summit rock. The crevasse was 15m wide and untold deep. The walls were partially collapsed on the one side of it making me very nervous. A narrow snow bridge two boots wide was the only crossing. I asked Kris what he thought. He said “What do you think?” I said “It looks reeeeealy sketchy.” He agreed. I told everyone that I was going to try it so keep the rope as tight as possible in case the bridge collapsed. I approached the edge and probed it with my ice axe. It seemed thick enough. I stepped carefully trying not to look down either side into the blue abyss. I was very glad to reach the other side. As the rest came across, I kept the rope tight as well till everyone was safely across. I was so disappointed not to get a picture of it but really had no opportunity to get my camera out. We climbed a short ice wall that led to a precarious rock outcropping where we removed the crampons for the final rock climb. Above: Gearing down for the last part of the climb. We climbed through a series of rock chimneys using a technique called, short-roping. No anchors are used but rather each person climbs and then stops in a position of stability to brake any potential slip by the next climber. 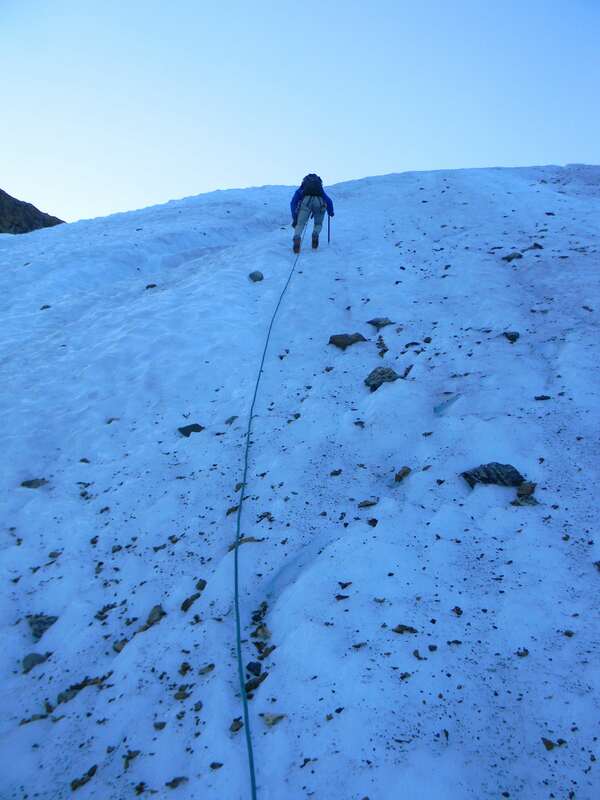 I felt quite good to have a rope on as I would never have climbed the summit block unprotected. The rock was quite solid but with loose rock covering the holds and a thousand vertical feet under your toes, the rope gives confidence to relax and be smooth and deliberate. 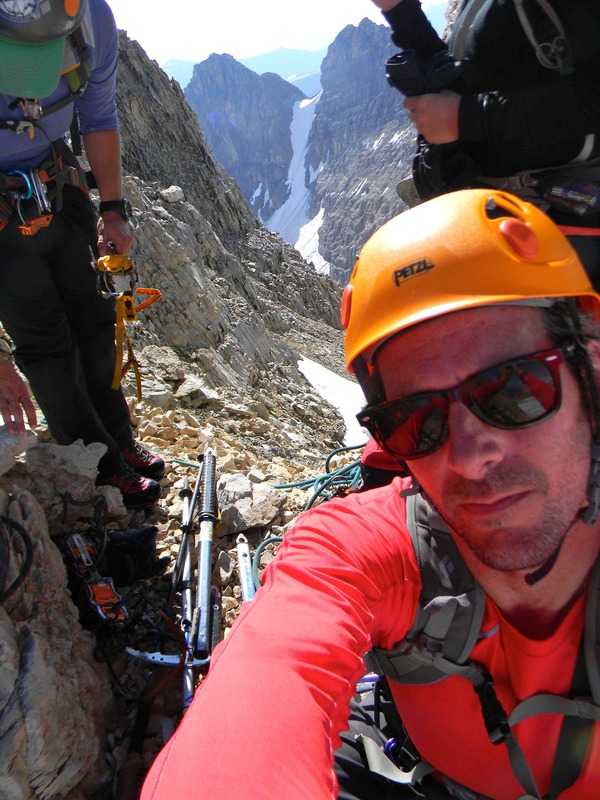 Below, Hugo belays (takes in the slack and protects in case of a fall) from the summit of A2. 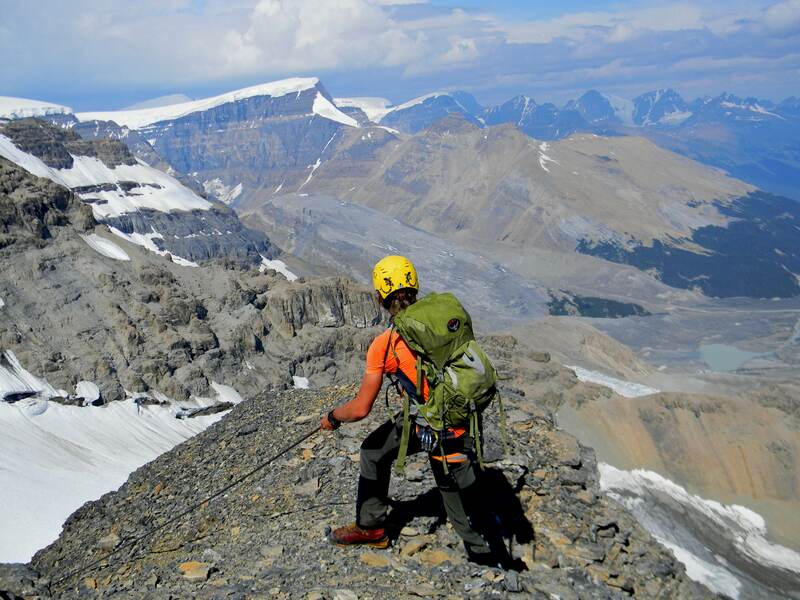 Above: Kris takes in the summit view surrounded by Canada’s biggest mountains. We enjoyed the summit view for about 5 minutes before starting the long descent home. Above: Glaciers are stunning to look at and problematic to navigate through. These chunks of falling ice are apartment block sized! 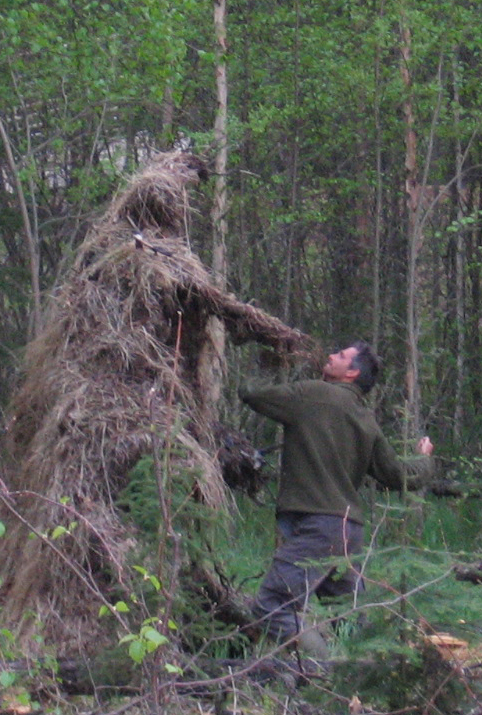 Not the kind of thing you can afford to get too close to. By the time we climbed down from the summit block, it had warmed quite a bit and we deemed the precarious ice-bridge too dangerous to cross. This necessitated a tricky bypass on the rock to return to the glacier. Similarly, when we retraced our steps back to the first vertical icewall we decided to descend a rock pitch rather than down climb the ice in the afternoon sun. The rock was fine though it would have been impossible to climb up due to its loose and crumbling nature. After our 3:30am start, we returned to the highway by 4pm. I drove back to Canmore exhausted but satisfied. I learned and honed new skills and improved my confidence in many situations. A fantastic way to celebrate being done another season of summer work! Wow. I started reading this post 3 times over the last month and always had something pull me away. Glad I came back to it. Your story telling has reached a mature place. I get a real sense of the entire journey and how things played out. Love to hear about the tough choices and reasons behind the decisions. I’m very sad not to see the narrow snow bridge you described. Pictures so often fail to capture the details of a climb well and this one sounds like it wouldn’t have disappointed.